Vladimir Putin has his own agenda for Syria and the Middle East. On Sunday and Monday, it became clear that Russia is using the downing of an Ilyushin IL-20 reconnaissance airplane last week as an excuse to change the rules of the game in the Syrian war and has now thrown Israel under the bus in its war against Iran. On Sunday, the Russian Defense Ministry presented its own investigation in the incident which killed 15 Russian servicemen. The Russian Defense ministry stuck to its opinion that Israel was to blame for the downing of the IL-20, although it was shot down by a Syrian S-200 surface to air missile (SAM). This occurred minutes after four IAF F16I warplanes attacked Syrian or Iranian targets in Assad’s home base Latakia in northwestern Syria. In addition, as Arutz Sheva reported last week, the Israeli F-16’s were flying at very low altitude - a tactic which has proven to be the right way to avoid being hit by an S-200 missile – while the IL-20 was at least 35 kilometers away and flying at a much higher altitude. The IAF furthermore presented the Russians with its own reconstruction of the tragic event. The IAF unequivocally stated that the four F-16’s were already back in Israeli airspace when the Syrian military randomly fired 20 S-200 missiles in all directions for more than forty minutes without checking air traffic in the area. On Sunday, Israeli journalist Avi Sharf fired off a tweet with new information about the downing of the IL-20 and wrote that the IAF struck its targets in Latakia at 21.41 P.M. while the Syrians started to launch the S-200 missiles at 21.51 P.M.. Instead of moving to safety and prohibiting the launch of the S-200 missiles, the Russian plane flew into the danger zone where it was downed at 22.03 P.M., according to Sharf. The Russians now claim that Israel gave an advance warning only one minute before the attack in Latakia. They also accused Israel of lying about the location of the imminent strike which they said would take place in northern Syria and not in the west of the country.. Both claims are untrue, however. The Israeli military warned the Russians via a special hotline much earlier, before the strike, and Latakia is located in northwest Syria, according to a senior IDF officer. “The message was passed on much more than a minute before the attack, an amount of time that was acceptable, as has happened throughout all the years the military coordination has operated," the officer reported. An IDF delegation headed by Air Force commander Maj. Gen. Amikam Norkin presented the Russian military with all these details during a visit to Moscow last week. “The comprehensive, accurate and factual details are known to the relevant professionals in the Russian military, and they clearly state that: the deconfliction mechanism operated in the relevant timeframe (as it has been operating over the last two and a half years); the IAF did not hide behind any aircraft and that the Israeli aircraft were in Israeli airspace at the time of the downing of the Russian plane,” the IDF said in a statement after Norkin debriefed the Russians. "In addition, as we saw during this incident, the use of advanced weapons by irresponsible entities significantly endangers the area and can severely harm forces operating in the region,” the statement explained. The Russian government has now announced that it will deliver the state-of-the-art S-300 anti-aircraft missile defense shield to Assad’s military within two weeks and will begin to jam radar signals in the eastern part of the Mediterranean Sea, something that severely hampers Israel’s ability to prevent the Iranian military build-up in Syria. Israeli leaders across the political spectrum have now called upon the United States to increase its involvement in Syria. Prime Minister Binyamin Netanyahu again called Putin to convince him not to deliver the S-300 system to Assad’s army. The S-300 is able to track up to 100 targets simultaneously while it can engage with 12 at the same time. The system has a range of roughly 200 kilometers and can reach targets flying on an altitude up to 27,000 meters. The delivery of the system had already been considered by the Russian government in April this year and would “create a no-go situation for Israel if allowed to be made operational by the Syrian regime,” according to weapons expert Jennifer Dyer who spoke with Arutz Sheva at the time. “Israel would lose the ability to preempt the ‘build-up’ to war before Iran and Syria can make it a full-blown war,” Dyer furthermore warned while adding that delivery of the system to Syria would endanger air traffic as far as the northern Negev desert. President Trump’s National Security adviser John Bolton said the Administration hopes that Putin will reconsider the delivery of the system, but didn't announce measures to prevent the supply of the S-300. Chances that Putin will indeed reconsider the delivery of the S-300 to Syria at this point in time are slim, however. The Russian leader has his own agenda for Syria and the Middle East. 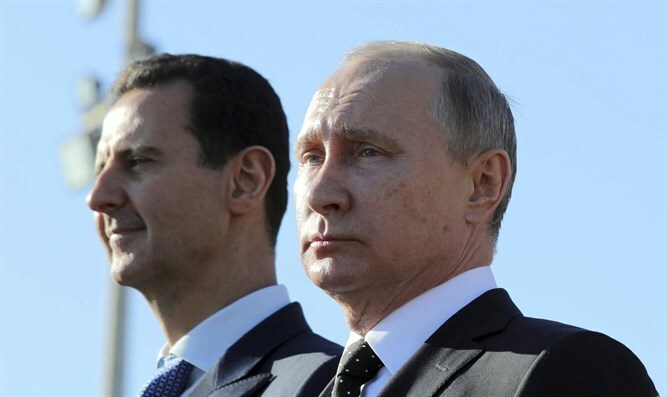 He most likely will use the opportunity to shore up his prestige and to bolster the regime of his ally Bashar al-Assad which is heavily dependent on Russian and Iranian aid. Netanyahu has now vowed that Israel "will continue to protect its security and interests," but he will have difficulty to continue Israel's struggle against Iran in Syria in the manner in which it has been conducted since it became obvious that the Islamic Republic used the civil war in the country to take over the country and to open a new front against Israel on the Golan Heights.